Canada’s leading restaurant furniture supplier helps Ontario Middle Eastern restaurant to a successful grand opening by supplying it with new commercial chairs, restaurant booths and tables. 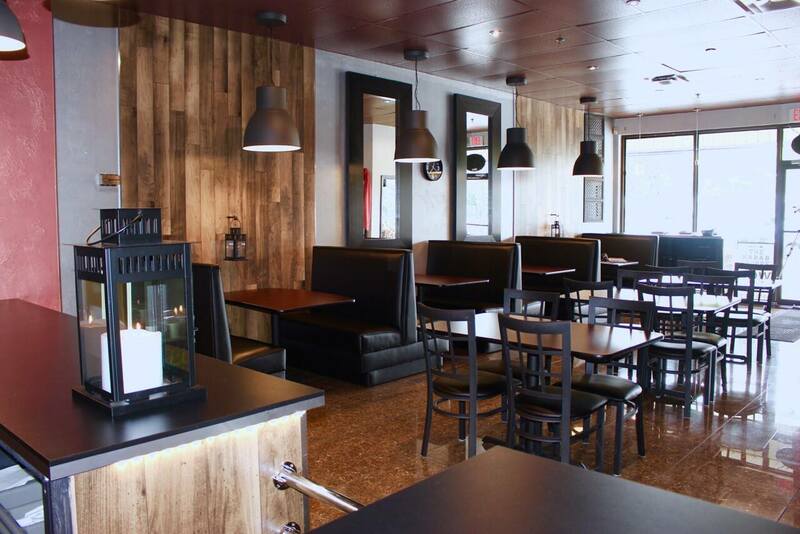 Canada’s leading restaurant furniture manufacturer and distributor, Restaurant Furniture Canada recently helped The Kabab Shoppe in Pickering, Ontario furnish their restaurant for their grand opening by supplying it with new restaurant chairs, dining booths and table tops. The Kabab Shoppe is a Middle Eastern restaurant in Pickering, Ontario. The Kabab Shoppe offers a variety of kebabs from different parts of South Asia and Middle East. They serve a an array of slowly cooked rotisserie meat and grilled meat. Kebabs are served with rice, fresh salad or naan. “The owner of The Kabab Shoppe contacted Restaurant Furniture Canada for new bar stools, table tops and restaurant booths because of their reputation for high quality at competitive prices”, salesperson Chris explained. “He decided to go with Restaurant Furniture Canada’s Window Back Metal Chair in black finish with padded seats upholstered in black vinyl”. Customers can choose between a solid wood seat or an American made padded seat upholstered in vinyl or fabric. The seats can be custom upholstered in any material for an additional cost. The frame is also available in copper vein, silver vein, gold and gold vein finishes. “The Window Back Metal Chair is a popular choice for fine dining and casual restaurants. They have and elegant look and the strong metal frame make them very durable” remarked Chris. Restaurant Furniture Canada’s Window Back Metal Chair sells for $44. A matching Window Back Metal Bar Stool is also available and sells for $65. A matching arm chair and swivel bar stools is also available. Customers can choose from 6 different finishes for the solid wood, saddle shaped seat or have a custom finish made for an additional charge. For additional seating he purchased the Standard Single Quick Ship Booth and the Standard Double Quick Ship Booth upholstered in black vinyl. The booths are also available in wine color. Restaurant Furniture Canada offers a wide selection of dining booths. All of Restaurant Furniture Canada’s booths are made in the USA and most can be customized to be built in any size and shape. The Quick Ship Booths can be delivered in 7 – 10 days. For tables, she purchased Reversible Table Tops in mahogany and black finish with black t-mold edge. The Reversible Table Tops also come in oak and walnut finish with brown t-mold edge. The tables are available in many shapes and sizes. Prices for the Reversible Table Top start at $35. The owner also purchased table bases, which are sold separately. “The Reversible Table Top is popular with restaurant and bar owners because it is very versatile and easy to clean” remarked Chris. “They are also durable and affordable, making them a smart investment. The owner liked the black and mahogany table tops because they back the black upholstery on her bar stools and dining booths. To browse Restaurant Furniture Canada’s full selection of chairs, bar stools, table tops, table bases, booths and patio furniture visit http://www.restaurant-furniture.ca/ or talk to a customer service representative at (888) 998-4222 for answers to all your questions on restaurant furniture. The Kabab Shoppe is located at 1450 Kingston Rd. in Pickering, ON. They can be contacted at: (905) 492-3144.